It’s a video gamer’s dream come true – a state-of-the-art video game lounge, complete with an eSports arena, eSports Academy, a student video game development training center, entrepreneurial training center, retail store, workspace and financial literacy center. And it’s coming to Memphis, specifically Soulsville USA, located in ZIP code 38126 and known as one of the nation’s poorest areas. A symbolic groundbreaking spectacle this past Saturday (announced that the LeMoyne-Owen College Community Development Corporation (LOC CDC) would build a franchised BraveDog Video Gaming Innovation Center (BDIC). 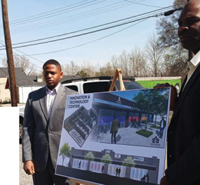 Residents, community supporters and elected officials converged on the site and cheered the highly anticipated project that will be housed across the street from the historic Four Way Grill at the corner of Mississippi Blvd. and Walker Ave.
“Although this is the poorest ZIP code in the state, it has endured because of the energy, the fight and goodwill of its people,” said Jeffrey Higgs, the project manager and executive director. “They ran Ida B. Wells off this same corner. Isaac Hayes and Maurice White and Al Green used to hang out over at the Stax Recording Studio. Dr. Martin Luther King Jr. ate at the Four Way Grill and our beloved college, LeMoyne-Owen College, (is) a 156-year-old institution. There is a lot of history here,” Higgs said. BraveDog Games CEO Dustin Mack, 28, co-founded the company with Isiah Reese. The BDIC will be housed in nearly 2,000 square feet and is projected to have an estimated $15 million economic impact in South Memphis and the downtown areas. “I was a South Carolina kid who only had a single parent,” said Reese. “What food we did have, Mother would divide it between my sister and I while she would drink water. People ask, ‘Why do you grind so hard?’ I just tell them that I work so hard because I can still hear my mother’s stomach growling through the night. Reese cited youngsters as the reason why the games lounge is so significant. LOC CDC president Michael Minor praised the “spirit of cooperation and pure joy” from young people at the school who were on hand to cheer the plans for a gaming lounge.“This facility will bring others into the community who don’t look like us,” said Minor. There are just no losers here. The excitement of our young people means so much. This will be our own community place where we can gather and just fellowship with one another. Mack admitted that the concept of earning six figures seems unrealistic for children and teens who live on SNAP benefits and welfare. “One of the most important ways to change the mindset of those who live in poverty is to help them see a way out of poverty and give them the tools necessary to build a better economic future,” Mack said.